Career Fair Prep: Snow Edition! Check your email for any announcements, there may be cancellations from employers, we will announce them if we hear anything ahead of time. (There will also be a notification board a the Career Fair). Wear snow boots and thick socks so you don’t freeze! 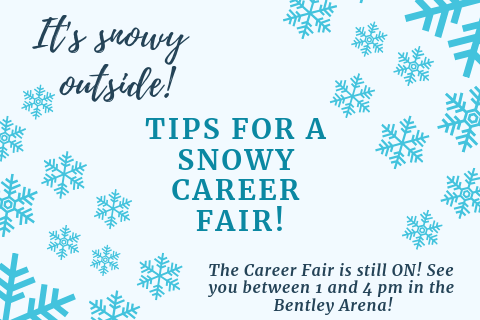 Bring a bag to put your wet snow clothes in while you network, or even to change into your business professional outfit in the Arena bathrooms. Don’t forget your change of shoes, sadly Bean Boots and Hunter Boots do NOT qualify as business professional footwear. Leave extra time getting to and from the Arena/Career Fair! Snow makes all travel time, both on foot and automobile-based, take a lot loner than expected. Be careful where you walk, the facilities team does their best but it’s better to be safe than to slip on the ice or slush. Enjoy your snow day and we will see you tomorrow!